posted by Daniel Crofts in GCASA, recovery, art. Lynette Gawron, clinical supervisor and licensed creative arts therapist at Genesee/Orleans Council on Alcoholism & Substance Abuse (GCASA), proudly presented clients' artwork at the "Fall Recovery Art Show" on Saturday. Organized in groups of eight people or less, art therapy sessions focus less on the finished product and more on the creative process. For this reason, Gawron likes to meet with people individually before they start. She says people sometimes come into it with the misconception that it is "arts and crafts" or training in how to be a better artist. In reality, the process is quite different. "It's about getting in touch with your true self," Gawron said, adding that the "true self" tends to be suppressed by addiction. Gawron said art therapy helps to bring the unaddressed problems and issues that fuel or are suppressed by addiction to light. "The emotional bubbling-up can be overwhelming," Gawron said. "(Art therapy) can be a way to channel that." The artist made this to show how her faith in God is helping her to "pick up the pieces" of her life and move forward. ...and a third depicting a calm exterior with "chaotic" emotions inside that come out "a little at a time." This poster reflects the unidentified artist's anger at what addiction has done to his/her life. Here is the artist's own description of this work: "This is about Light on the face and a path like the 'yellow brick road.' I look through the windows on my path at new things as I make choices in my life." The artist who made this was present at the event. She said this represents, at the same time, the oppression of her addiction and the freedom (symbolized by the butterfly) of her recovery. ...such as this one containing tiny drawers, pockets, pictures and other items. Gawron described it as a kind of journaling. Each page might have a separate theme relevant to the artist. 2. Writing about all the negativity in one's life, painting over the writing and overlaying it with positive words and/or imagery. For more information, call Gawron at 815-1850 or e-mail [email protected]. posted by Billie Owens in batavia, GCASA, Lisa Barrett. Tomorrow is the first of three singing auditions for students in grades 8 to 12 in Genesee and Orleans counties who would like to participate in a professionally recorded music project with renowned local artist Lisa Barrett. The Batavia singer/songwriter wrote a poignant song called "Everyday Hero" -- about youths who choose to be drug, alcohol and tobacco free, and who are positive leaders. She is sponsored by GCASA, where she is a prevention educator, and received a Reach Grant this year from GO ART! Barrett is hoping to gather a choir of about 30 students to perform this song on Saturday, April 30, at the Linden Oaks Studio in Rochester where it will be professionally recorded. After the recording is complete, the song will then be turned into a You Tube music video. Along with the audition, potential choir members will be asked to submit a short essay. The essay content should include why they want to be a part of this project, as well as their views on tobacco, drugs and alcohol use. Either email completed essays to [email protected] or bring a copy to the audition. The auditions will be held at GCASA’s Batavia site, 430 E. Main St. The Everyday Heroes Project is made possible by the New York State Council on the Arts, with the support of Gov. Andrew Cuomo and the New York State Legislature. posted by Daniel Crofts in Batavia Muckdogs, GCASA, Genesee County Drug Free Communities, vandalism. Jenna Raphael, of Batavia, spent a lot of time with the quaint little structure she affectionately calls "her house" during baseball season last summer. She had hoped that it would inspire people to take pride in their community. The little red house, which is at Dwyer Stadium and manned during Muckdogs games as an information area for the public, was vandalized some time during the last few months. Muckdogs General Manager Travis Sick discovered the damage after the winter snow melted. He said there's no way to be sure when the incident actually took place. Furthermore, since no one is at the stadium at night, there is no way to determine who the vandals are. Sick suspects it may have been a group of kids in the area. Fortunately, the damage was not extensive. The door was kicked in and the lock severed (above photo); parts of the door were broken off, so it will need to be fixed. There was also some debris on the floor inside that was not there before. Nevertheless, Sick and Raphael both see this as a "disappointing and almost ironic" incident (Sick's words). "The sign says 'take pride in your community,' and someone decided not to do that," he said. "It's hard for me to understand what motivates kids and adolescents to do this," Raphael said. "I don't think there is enough to occupy youth in this community, therefore they turn to these types of mischievous behaviors." Locted near the stadium's Kid's Zone and, Sick says "off the beaten path," this house was given to Genesee/Orleans Council on Alcoholism & Substance Abuse (GCASA) last year. GCASA staff repainted it and made the above sign. Raphael used it as a station from which to share information with Muckdogs spectators about Genesee County Drug Free Communities Coalition's (a GCASA program) efforts to address and improve environmental conditions that can lead to problem behaviors -- drugs, alcohol use, crime, fighting, etc. -- among our youth. For information on the coalition and, by extension, how this fits in with their overall mission, click on the following link: http://thebatavian.com/blogs/billie-owens/gc-drug-free-communities-top-10-finalist-international-honor/22803). "Vandalizing a house (with a sign) that says 'take pride in your community' shows a lot of disrespect," Raphael said, adding that it "sends a distasteful message to those who continually work to make Genesee County a healthier and safer place to live." She hopes to use the house again during the Muckdogs' upcoming season, in spite of what happened. Because there is really no way to find out who the culprits are, no charges are being pressed. But Sick is encouraging any community members who are in a position to do so, to keep an eye out for suspicious activity at the stadium at night. "If you see anyone walking around that shouldn't be there, call the police." posted by Billie Owens in Announcements, GCASA, Smoke Free Now. This information comes from Kevin Keenan, Smoke Free NOW coordinator at GCASA. Local students braved the cold to show their support of Kick Butts Day and stood on the corner of Main and Jefferson streets holding signs depicting the negative impact of tobacco -- especially for youth. Students for Cain's Tae Kwon Do Academy took part Monday and about 22 teens in Oakfield-Alabama’s Leadership Class did so Wednesday. Kick Butts Day is the Campaign for Tobacco-Free Kids’ annual celebration of youth advocacy, leadership and activism. On Wednesday, thousands of youth in every state and around the world decided to STAND OUT…SPEAK UP…and SEIZE CONTROL AGAINST BIG TOBACCO. The Cain’s academy participation was organized by Smoke Free NOW -- a program of Genesee/Orleans Council on Alcoholism & Substance Abuse (GCASA) – as part of a campaign to protect kids from the impact of tobacco marketing in stores where 75 percent of teens visit each week. More young people across the state are recognizing the powerful influence of tobacco marketing and saying no to the addictive habit. Smoke Free NOW congratulates the efforts of these students who’ve set a good example for their peers. Studies show that exposure to cigarette advertising leads nonsmoking adolescents to initiate smoking and to move toward the habit of smoking. Each year in New York State, 20,900 kids under 18 will become new regular, daily smokers and more than 380,000 kids now under 18 will ultimately die prematurely from smoking-related illnesses. posted by Billie Owens in Announcements, GCASA, drug-free communities coalition. There will be a Drug-Free Communities Coalition Board meeting at Terry Hills Restaurant from 8:45 to 11 a.m. on Tuesday, Dec. 14. Please RSVP by Dec. 10 by contacting Carol Nicometo at 815-1873 or via e-mail at <[email protected]>. The restaurant is located at 5122 Clinton St. Road in Batavia. posted by Daniel Crofts in Announcements, GCASA, Seniors. The Senior Spice Committee, a program of Genesee/Orleans Council on Alcoholism & Substance Abuse (GCASA), invites Genesee County senior citizens to the “All That Glitters Dinner Dance” on Saturday, Dec. 4. It will be at First Presbyterian Church, 300 E. Main St. in Batavia, from 5 until 8:30 p.m. Registration must be received no later than Friday, Nov. 26. Admission is $10 per person and includes dinner, dancing, and holiday and dance music from the Batavia Swing Band. Individuals and couples can also have photos taken by Bill Moon, free of charge. The evening will follow this schedule: 5-5:30, social time with punch; 5:30-6:30, dinner; 6:30-8:30, dancing. Dinner will include salad, Swiss steak, potatoes, vegetable, dessert and beverage. For more information about “All That Glitters” or the Senior Spice Committee – which will hold its next meeting at GCASA, 430 E. Main St. in Batavia, at 1:30 p.m. on Dec. 8 – call or e-mail Sue Hawley at 815-1872, [email protected]. posted by Daniel Crofts in events, GCASA, Seniors. posted by Daniel Crofts in events, GCASA, pizza, families. Genesee/Orleans Council on Alcoholism & Substance Abuse (GCASA) invites you to the Annual Pizza Gobble. It will be at St Joseph School, 2 Summit St. in Batavia, from 6 until 8 p.m. on Tuesday, Nov. 23. The Pizza Gobble is open to the public. Families are encouraged to attend and reexperience the lost art of the family dinner. Come and enjoy pizza from several of Batavia’s pizzerias, dessert, and a chance to win great prizes. Admission is $1, and we are accepting canned goods to be donated to the Salvation Army. posted by Daniel Crofts in Announcements, GCASA, Media Literacy Program. That’s the question that Prevention Educator Laura Ricci of Genesee/Orleans Council on Alcoholism & Substance Abuse (GCASA) wants to get young people thinking about. Ricci teaches Media Literacy, an ongoing prevention program, to Genesee County students along with other GCASA staff. GCASA started implementing these presentations in the schools two years ago, and they are still going strong. Holy Family School in Le Roy included the program in its Red Ribbon Week activities last week. Ricci came to teach two Media Literacy sessions – one to fourth- through sixth-graders, one for seventh- and eighth-graders. Students were excited about the presentation and contributed by sharing stories about their own experiences. Today’s youth are exposed to greater volumes of media input than any other generation, from television to radio, iPods, billboards, store advertisements, video games, magazines and the internet, and more. The goal of the Media Literacy Program is to inform them about how they are being influenced by the media without realizing it, and to get them thinking independently and critically about the messages being conveyed by commercials, television shows, advertisements, etc. Each presentation is age-appropriate, but all of them raise the same points and questions about media influence, with particular focus on how companies have used it to market alcohol and tobacco products. • Who created the message, and why? • Who is the target audience? What suggests this? • What is the text of the message (the actual words and pictures portrayed)? • What tools of persuasion are used? • What part of the story is not being told? She showed the students commercials and print advertisements that exemplified persuasive techniques such as beauty, humor, and fame/status. Once she moved onto the cigarette ads, she talked about the target audience. For more information or to request a Media Literacy session at your school, call Shannon Ford at 815-1876. Disclosure: Dan Crofts is employed by GCASA. GCASA's Art Therapist, Lynette Lex, sees the talent and raw emotion in the art her clients create during group. She thought it was time to share their beautiful work with the public. September is Recovery Month and her clients are in various stages of recovery from alcohol or other substances. On Thursday, September 30th from 5-8 pm, many unique and menaingful pieces of art were on display at GCASA in the Carter Conference Center. Refereshments were provided by Miracles in Motion, a new catering initiative. posted by Pamela LaGrou in awards, GCASA, community awareness. posted by Pamela LaGrou in events, fundraisers, GCASA, chicken BBQ, community events. Chicken BBQ to benefit GCASA Women's Program is being held on Wednesday, June 30th from 4-6pm or until sold out. Stop by 430 East Main Street for a Clor's Chick BBQ including baked beans, salt potatoes, roll and butter for $8.00. Curbside delivery available- simply pull up and order your dinners. Pre-sale tickets available, call Norma at 343-1124.
posted by Howard B. Owens in batavia, schools, GCASA. On Thursday, we published a picture of the winners of GCASA's "drug free" poster contest. Laura Russell Ricci later sent along scans of the actual winning posters. Above is a submission by Sarah Scott, and below, Nathan Moore. More winning posters after the jump. 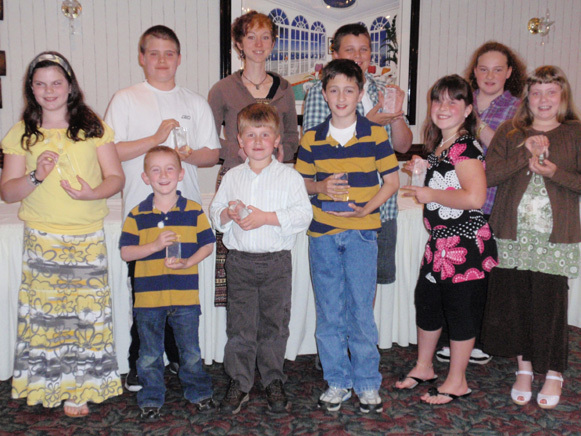 On Tuesday, May 18th, 2010 GCASA honored winners from schools throughout Genesee County at our Annual Poster Contest. Pictured are our winners: Caitlin Napper, Aidan Berne, Aiden Sisson, Gemma Bochicchio, Stephanie Hoy, Jacob Cryer, Laura Winspear, Austin Hynes-Fisher, Michael Shepard and Grand Prize winner Sarah Scott. Our other winners not pictured are Nathan Moore and Olivia Marchese. Congratulations to all of the students! posted by Howard B. Owens in GCASA. Marijuana and alcohol use among Genesee County's 11th graders has dropped significantly since 2000, GCASA Director David Markham reports on his blog, GCASA cares. He said the data comes from a survey administered by GCASA every two years to the county's 6th through 12th graders. Apparently, the 2010 data is not yet available since Markham does not share those numbers. Markham concludes his post with a question: How do you account for the change? posted by Howard B. Owens in GCASA, marijuana. In a blog post, GCASA's executive director David Markham muses that perhaps society would be better off if marijuana were legal and taxed. But it's no libertarian turn by Markham. He also suggests that the legal drinking age should be raised to 35. Markham cites a recent study that looks at the benefitial impact of drinkers and drug users substituting cannabis. I found this study interesting because I have observed the use of cannabis in my private practice clients who often report beneficial effects. It seems to me that cannabis is less toxic and has fewer behavioral and social negative consequences than alcohol. I have also noted that cannabis seems to have fewer adverse side effects and better symptom relief than prescription drugs. GCASA Executive Director David Markham addresses persistent claims that agency employees are money grubbers leaching off of taxpayers. According to Markham, most GCASA employees earn substantially less than the Genesee County's median income of $49,133. The average GCASA salary is $26,500, with 81 of GCASA's 92 employees earning less than $40,000 per year. Markham said he has a master's degree and 41 years experience, yet earns only $74,459.32, and he turned down a $1,400 raise. The agency is currently facing a $135,000 budget deficit.